I have spent a while before i decided to use my nitrokeys. Finally i have come to the point where i need to set up some servers and attempted to set up the nitrokeys i purchased for use with ssh, i wanted to make sure i had 2 nitrokeys because i have a habbit of losing stuff, which is thankfully not yet the case. 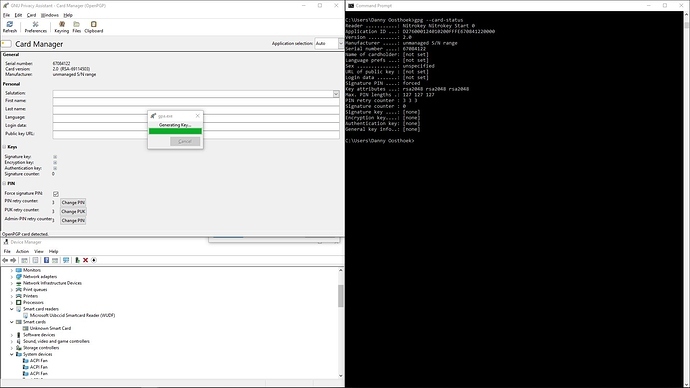 I followed the steps described here: https://github.com/djozsef/openpgp-docs/blob/master/Setting%20up%20EIDAuthenticate%20with%20OpenPGP%20card.md#generate-keys which went well. It confirmed my nitrokey was set up. I had keys attached to it altered the name and email. And then attempted as suggested to alter the user/admin pin. the user pin went fine. The admin pin not so much, it kept notifying me that it was a bad pin after three times it reported another error not allowing me to alter anything anymore, I figured a factory reset was in order because i messed up somewhere. This is where i run out of options because no post on the forums nor google lead me in the right direction for a solution to this. as explained on https://nitrokey.com/start you need to set up the admin pin first. Otherwise you are going into the admin-less mode were the user pin is the same as the admin pin, kind of disabling the differentiation. Thus, your attempt to change the admin pin leaded nowhere as you tried to change from 12345678 to new one, although it was already changed. I don’t know about the issue you have now, but I suggest a new reset and then follow the instructions again. Thank you very much for your reply, i know i followed the wrong installation instructions. Therefore i wanted to follow the one you linked to right now. Unfortunately i did not. So i ended up trying the factory reset. And follow the instructions you show me. 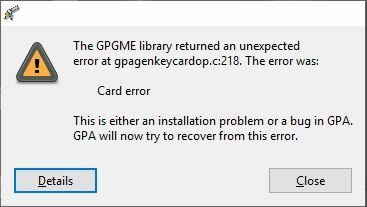 But that’s where everything i do gets the card error. Any tips on how i can factory reset the card? How to reset a Nitrokey? TLDR: I fixed the issue. It took me quite the list of actions to get the nitrokey back into a useable state. attempt to install, failed due to pin before admin pin. Hope this helps someone else with this problem.